Whisky Sauce Braised Pork Recipe | Simple. Tasty. Good. Well look at this Spanish beauty! Pork in whisky sauce! Ever heard of that? If you have been to Sevilla (Spain) or in that neighborhood before, you definitely must have run into it ’cause it’s a fixed dish on every restaurant’s lunch menu around there. The Spanish call this one ’solomillo al whisky’. Cute, isn’t it?! If you haven’t got any whisky around you can also use bourbon or brandy instead. Some Spanish recipes use a mix of white wine and whisky. Solomillo al whisky is served with fried potatoes or a lukewarm potato salad with olive oil, vinegar, fresh parsley and raw onion (also known as papas aliñás in Spain). 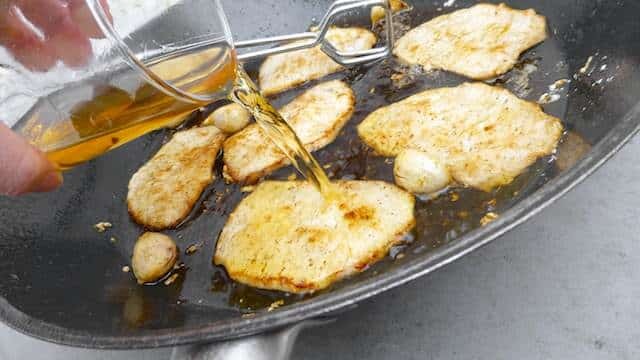 Do you love cooking with whisky? Then take a look at my white beans and quail in salted butter and whisky! 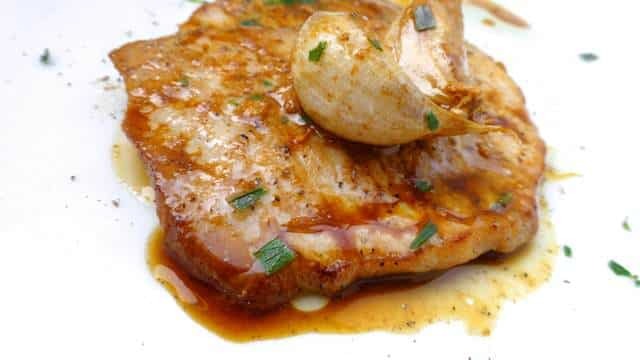 Succulent pork fillets braised in a strong whisky sauce with garlic, also known as solomillo al whisky... A savory Spanish recipe! 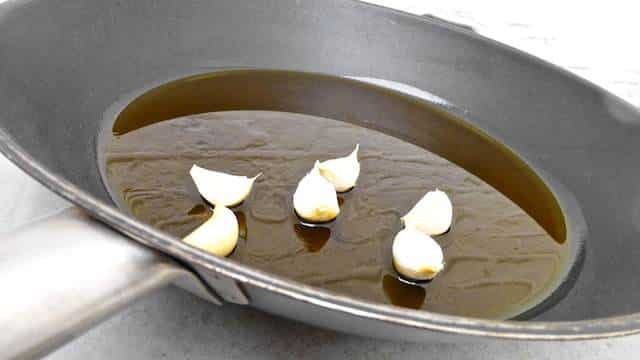 Pour the olive oil in a large non-stick pan and add the unpeeled garlic cloves. Put the pan over medium-low heat for 10 minutes. Stir the garlic regularly until soft. 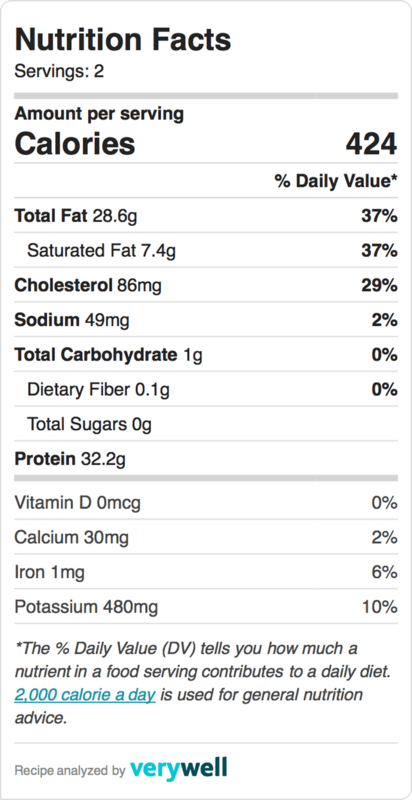 The pork fillets should be ¼-inch max in thickness. You can make them thinner by wrapping them in cling film and flattening them using a meat mallet. Season on both sides with a little pinch of pepper and salt. 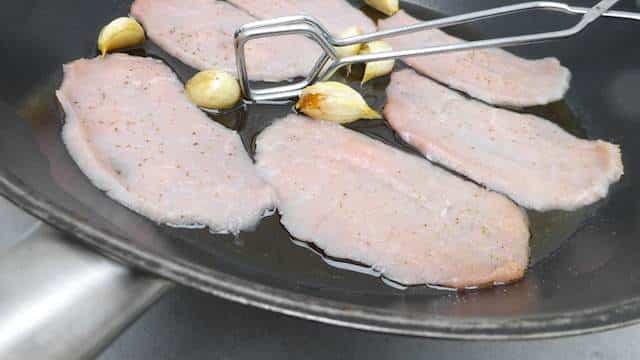 Turn the heat under the pan with garlic cloves higher. Add the pork to the hot oil. Quickly sear the pork on both sides for a minute. Put a lid on the pan and turn the heat low. Simmer for 2 to 3 minutes until the pork is cooked all the way through. Check if the seasoning of the whisky sauce is good and add extra pepper or salt to taste if necessary. 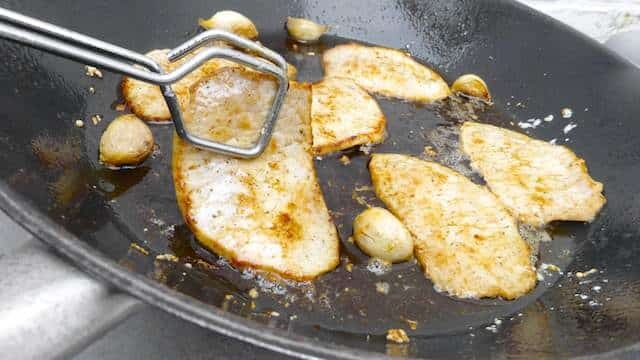 Put the cooked pork fillets onto warm plates and drizzle with the sauce. Top with the garlic cloves. Add a last sprinkle of freshly ground black pepper and serve immediately. I was born in Spain and visit the family when I can. This is one of my favorite Tapas that I get every time i’m there. I’ve made it here and it doesn’t turn out quite the same. Excited to try your recipe tonight. I’ll update on how it turns out. Is there an ingredient missing in the sauce? Mine was liquid like whisky, soicould pour it, but not drizzle it, and it had no color like the photo.